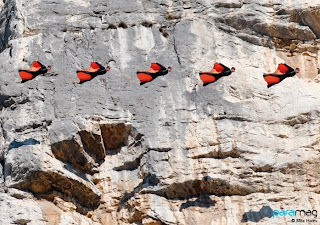 French online mag Para Mag have just published a stunning picture of Phoenix Fly jumper James Boole, doing what he does best... eating stroopwafels and making babies Flying inches away from a rock face looking cool as a cucumber. The suit appears to be a prototype that was flown during the last WoM event and not his usual tipple, the Vampire V3. If you speak french, or want to see the image in all its glory, check out this link.